DENVER, CO--(Marketwire - December 22, 2010) - The nexus of the traditional West and the urban frontier, Denver is a city of delights and natural beauty. Today, modern-day pioneers flock to Denver for world-class skiing and biking, serene hiking and intense rock climbing. They travel here from far and wide to imbibe famous microbrews, stand in the humbling presence of massive peaks or find prosperity in the booming computer and telecommunications economy. From exciting venues to downtown Denver hotel deals, one of the ways to truly experience all the city has to offer is to spend New Year's there. And a downtown Denver hotel like the Denver Marriott City Center is the perfect base camp for any mile-high celebration. Whether you're hitting clubs like miniBAR, City Hall or The Good Life, or heading over to the 16th Street Mall for the annual fireworks display, New Year's in Denver is unparalleled. This year, music fans can enjoy one of popular jam group Widespread Panic's two shows at the Pepsi Center on December 30th and 31st. For visitors seeking accommodations for the holiday weekend, the Denver Marriott City Center is proud to offer Last-Minute Weekend deals starting at $99 per night* with a two-night stay. Unique among downtown Denver hotels, the Marriott City Center features panoramic views of the Rocky Mountains and the city skyline. This downtown Denver luxury hotel near Larimer Square is also convenient to the business, shopping and entertainment districts including Historic Lower Downtown (LoDo) and the 16th Street Mall, as well as top attractions, including nearby skiing, Six Flags Elitch Gardens, Coors Field, Invesco Field at Mile High, Pepsi Center and the Convention Center. The Marriott City Center is also convenient for meals and socializing. The hotel's D-Spot Lounge and Allie's American Grille are popular among hotel restaurants in Denver, offering a culinary mix of American specialties, as well as a casual environment where guests can relax with friends or colleagues before, during, and after New Year's festivities. * Availability will be confirmed at time of booking. Lowest advertised rate may not be available. Advance booking required. Rates valid for Friday and Saturday night stays only. Two-night minimum stay may be required. Rates are per room, per night, based on single occupancy. Taxes, resort fees, and incidental charges are additional. Rates may not apply to groups of 10 or more rooms and cannot be combined with any other offer or discount. Additional restrictions may apply. Located at the heart of downtown Denver, the Marriott City Center offers easy access to the sights and sounds of the city. With 599 rooms and 14 suites on 20 floors, this downtown Denver hotel also features 24 conference rooms and 27,000 sq ft of flexible meeting space, as well as an indoor pool with hot tub and steam room. Three concierge levels and available services like babysitting, on-site laundry and limousine service make any stay comfortable and convenient. 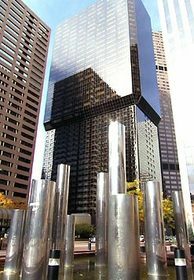 The Denver Marriott City Center, located in the heart of downtown Denver, is walking distance to Coors Field, Pepsi Center, Larimer Square, Pavilions and LoDo.